Here's a run down of events leading up to this. Maybe 2 years ago, heat and air worked fabulously. Then one day, MAX setting on cold air stopped working, but all other settings continues to work. Maybe a few months after, no air came through the front vents - it only came from the defrost vents (when set on defrost). Now, no air (hot or cold) comes from from vents or defroster. Heat/air only work from rear vents. I think you can hear some kind of vacuum noise when you turn the air unit on - it kind of sounds like air coming out of a small balloon. I got under the hood and checked all the hoses and they looked ok. I did the spray with water test too and the hoses passed. I have read and watched videos about possible fixes til I can't see straight. Does anyone know what might be going on? I'd really like to try to fix this myself or at least have a general idea of what needs to happen to get this corrected. Thanks for light you can shed on my issue! check out the forums link i posted most often the blender door breaks in these trucks. I did not get the forums link can u Please send it thanks. it's not the blend door ! it's not the blend door actuator ! i have seen a bunch where the main issue is the blend door. But its often the thing that attaches it to the control unit. The tab breaks off and the arm that adjusts the blend door just hangs down doing nothing. The air blend door actuator only changes the temperature setting. It DOES NOT have anything to do with the position of which the air comes out. yeah I am having the same problem with my 2000 mercury mountaineer. There is no air coming out of the front or defrost vents. The vents for the back seats work, but that's it. I heard that this is actually the blower motor under the hood. This is like a $50 dollar fix if you order it online and watch the 1A auto video that demonstrates how to replace it! 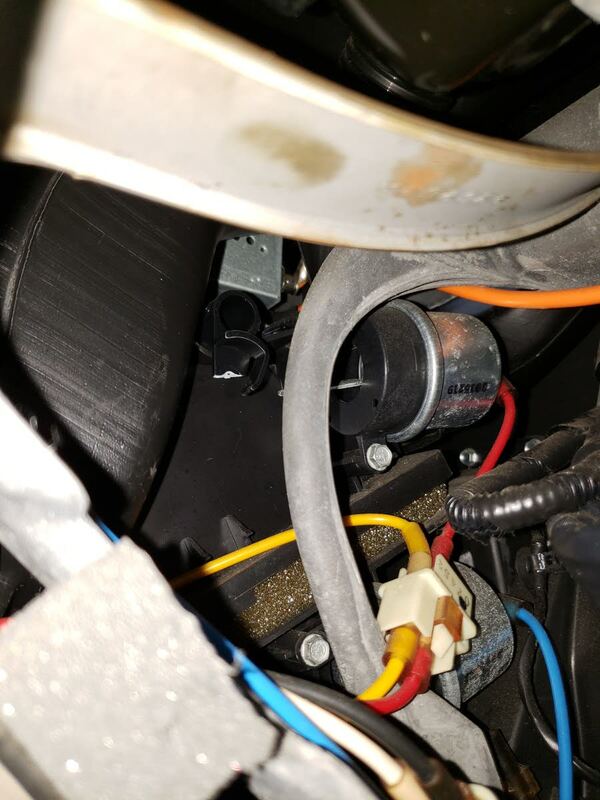 I had the same problem with my 2004 Explorer, everybody was saying that the blend actuator was the problem, look a bunch of videos to know how to do the job, well I replace the actuator and it didn't fix the problem, so I proceed to look at the system and found on the passenger side and found another damper with a plastic arm broken wish connect to the pneumatic actuator, luckily it was an easy fix for me, I replace the broken arm with a piece of plastic to extend and emulate the broken part, screwed, connect the actuator and that fix the problem, so I spent $40.00 on the electric actuator that I didn't need..
if the ac is warm then you lost your coolant some place. Comman places for leaks is the ac rad or at the air box inside the car. if the grill is leaking you will see a large dark spot on it. I have a 2010 ford explorer. I was told the little vent or flap the directs the air to the front vents was getting stuck. What can i do to repair it. For me temp controlled air was coming out the defrost vents and not the front vents. Have an arm under the glove box broken. Was able to stick my hand in there and switch it back for the time being. I have an 02, everything seems to work except the defrost, pulled the motor, clean up inside. . The 3 actuators on the passenger's side all seem to function properly as does the door above the blower motor. No vacuum leaks at those points either. Checked the vacuum lines in the engine compartment, 15 inches at 5200'. The door for the defrost seems to work but no changes at the actual openings by the windshield. The same lever for the front vents broke on my 2010 Sport Trac just the other day. I took the liberty of fixing it but it was hell with tight quarters! Plus I found a cable bundle that had been rubbing against the frame structure behind the dash. Eventually that would've caused all kinds of fun. 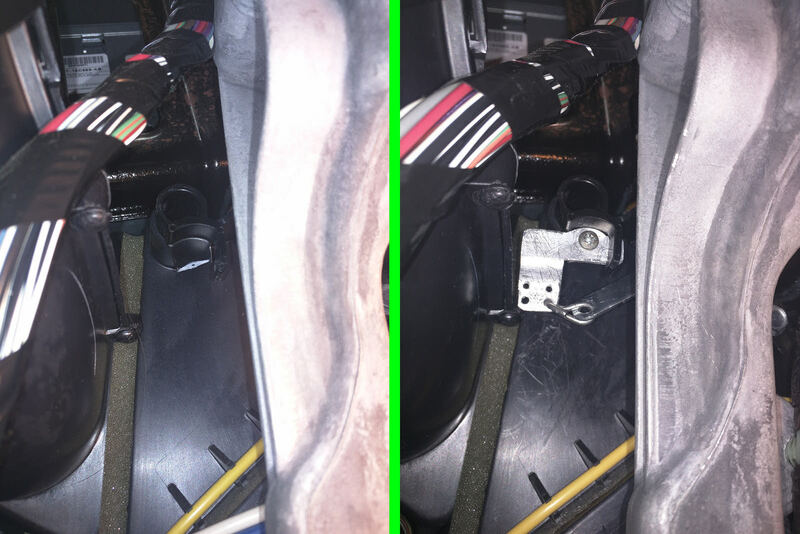 Here's the before and after photo of the "fix". Those actuators are pulling way too much in my opinion. A dampening spring would help relieve each end of the cycle. Start a new Ford Explorer question. Looking for a Used Explorer in your area? CarGurus has 73,725 nationwide Explorer listings starting at $750.